Singer 9960 Quantum Stylist Sewing Machine is the latest and the advanced type of sewing machines produced by Singer. Singer is the proud producers of world’s most advanced sewing and embroidery machines. And, this company has not disappointed the customers this time too. 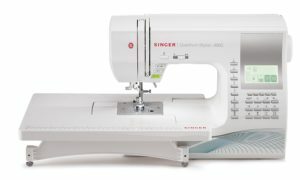 The current model is the most appealing product and you can completely computerize your sewing process with the help of this. The Singer 9960 sewing machine would reach your hands with its internal skeleton been constructed using heavy duty metal. The rigid support would hold all the mechanisms in a perfect alignment and would also provide the required durability to the sewing machine. The system comes with two lamps in order to illuminate the sewing surface. The machine has been constructed using DC motor which would provide an instant start and stop without any coasting. There is also an extension table which will provide you with a larger working area. Unlike Singer 4423 heavy dutysewing machine which would provide you with the sewing speed of 1100 stitches per minute, the current model offers a lower sewing speed of 850 stitches per minute. Automatic Needle Threader: Threading will be made easier with this machine by the help of automatic needle threader. You can even see the threading instructions printed on the sewing machine. 600 Built-In Stitches: You will be surprised to know that this sewing machine comes loaded with as many as 600 in-built stitches. There is also a reference chart on the upper lid of your machine which would allow you to select the appropriate stitch. Bobbin Loading: The bobbin loading is easier with this machine and is to be loaded from the top. There is also a clear cover which makes it convenient for monitoring the bobbin load. 13 Fully Automatic Built-In Buttonhole Styles: This model comes with 13 fully automated in-built buttonhole styles. There is also an exclusive buttonhole under-plate. This makes buttonhole sewing to be completed in a single step. Per the sewing machine reviews, the number of styles provided by this machine is quite rare to find in other models. Free Arm: There is a removable free arm in this model which will provide you with an easy access to difficult-to-reach areas like collars and pant hems. Brightness Control: The system comes with large and back-lit LCD screen with the brightness control. This would provide you with clear viewing of stitch functions. You can also adjust the brightness of screen. LED Lights: There are two LED lights which would illuminate the work area and are always cool to touch. Wide Stitch: You can be able to set your stitches to almost 7 mm width with which you can create attractive and decorative stitches. In addition to the above mentioned features, there are also some additional features in this sewing machine which makes this model as the amazing sewing machine of recent times. Information Advisor: This machine comes with the digital information advisor which would include the selected stitch type, length and width along with the recommended presser foot. These are displayed on LCD screen. Thread Trimmer: You can trim the thread automatically by just pressing the thread cutter button. Mirror Imaging: By using this feature, the selected stitches can be mirror imaged. Elongation and Stitch Editing: You can elongate the stitches by the help of this feature and you can control the actual look of the stitch pattern also. Automatic Stitches: You can set the automatic stitches with the optimum length and width. Auto Pilot: You can gain the complete control over the speed even after unplugging the foot control by using this function. Needle Up/Down Button: Pressing needle up/down button would allow you to change the needle position when the machine is stopped. A perfect feeding will be maintained with this machine as the feed dogs are moving in a box motion. With this system you need not worry about the feeding at all. The bobbin winding is safer with this sewing machine as the needle bar would automatically disengage when the bobbin winds. The bobbin would stop turning automatically when it is completely filled. Hence, the need of worrying about the overfilling is eliminated. In this machine, you will have a direct access with eight popular stitches and the stitches will be adjusted automatically for twin needle sewing by using electronic twin needle control. There is an automatic locking stitch function to tie-off decorative stitches by just pushing a button. Thus, sewing is made easy with this model. You can push the automatic reverse button to sew in reverse direction. The horizontal threading with this system would allow you to feed more evenly. There is an auxiliary spool included for vertical threading. There are as many as 25 needle positions with this model. This model would warn you for any probable error. There are also high-end features like automatic tension, extra-high presser foot lifter, optimum power control, on-board storage, 5 built-in alphabets, six second threading, zigzag taper, 18 presser feet along with snap-on presser feet and bonus presser feet and these cannot be beaten by any other model of current times. The product would come to you with limited 25 year manufacturer warranty including 5 years on electronic components and 1 year on adjustments.. The presser foot pressure cannot be adjusted for those who would like to fine tune the pressure. The bobbin cover which is made of plastic will be little loose and could come off very easily. You will be surprised to see this multi-purpose machine working well with several sophisticated functions and smart technology. The generous stitches and customization which are available at affordable price are the major reasons for the success of this price. With tons of unbelievable features, Singer 9960 Quantum Stylist Sewing Machine will be the best purchase of the season.